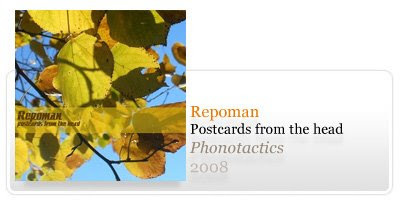 Repoman’s music is somewhat a landscape portrayed under musical forms. Dreamy keyboards mixed with field recordings and gentle beats embrace us in a calm mood that lasts throughout its 37 minutes. “C64 (Part 2)” could be easily featured in any of Tarantino’s recent movies, while the reggae rhythm of “Rooney” is wrapped in a vinyl sound that becomes part of the song itself. The psychedelic keyboard melodies appear out of nowhere into the main themes, and the beats flow naturally, with no sudden changes or wild variations. “Breathe Deep (Outro)” sounds as if it was recorded in a forest, with arrangements caught directly from the leaves of the tallest trees. The highlights here are the opening tracks, “Copper’s Knock” and “Hell’s Teeth”, the first being guided by an hypnotic melody and a relaxing beat, the second being a mix of some 70’s psychedelic rock atmospheres with minimalist beats and repeated bass lines. Repoman’s work is definitely interesting, soothing and relaxed, as if the music went directly from the composer’s heart to its original form. Overall, it’s a good album, and you won’t feel like you’ve wasted your time here, for it is sure to ease your mind and keep you focused. 5º release da única netlabel "alentejana" que como manda a regra aos poucos vai construindo o seu portfolio sonoro, REPOMAN apresenta neste POSTCARDS FROM THE HEAD um downtempo limpido e cheio de personalidade.... espero que gostem.